Badgley knocked down both of his extra-point tries Sunday in the Chargers' 41-28 loss to the Patriots in the divisional round. Badgley made five of his six field-goal attempts Sunday in the 23-17 wild-card win over the Ravens. Badgley made all three of his extra-point attempts in the 29-28 win over the Chiefs on Thursday. Analysis: Badgley didn't have any opportunities to kick a field goal, but he was perfect on his extra points, which is all the Chargers needed in order to claim a come-from-behind victory. Badgley has been a sight for sore eyes for a franchise that has been consistently plagued with below-average special teams and is generally a solid fantasy option given the Chargers' explosive offense. Badgley made both of his extra-point attempts and all four of his field-goal attempts in the 26-21 victory over the Bengals. Analysis: It's not an exaggeration to say that Badgley's performance won the Chargers the game, as the rookie kicker was brilliant, connecting on an important 59-yard attempt to end the first half. Badgley has missed an extra point and field goal this season, but that's still light years better than recent production from previous Chargers kickers. Badgley hit one of his two field-goal attempts and both of his extra points in Sunday's 33-30 win over the Steelers. Analysis: Badgley missed from 52 yards in the game's first quarter, but after a crazy sequence in which the Steelers committed three straight offsides penalties resulting in two untimed downs, the rookie kicker was able to convert the game-winning kick from 29 yards out. The Chargers have a favorable home matchup against the Bengals in Week 14, so Badgley could find himself busy in a game where the offense should be able to move the ball down the field. Badgley made his only field-goal attempt and six extra-point attempts in the 45-10 win over the Cardinals on Sunday. Analysis: Badgley put his struggles from last week behind him, connecting on all seven of his kicking attempts over the course of the afternoon. Badgley has missed just one kick in his brief tenure as the starter, but so long as the Chargers continue their excellence in the red zone, the rookie's kicking opportunities remain limited. Badgley made one of his two extra-point attempts and knocked in all three of his field-goal attempts Sunday during the 23-22 loss to the Broncos. Analysis: Badgley's lone extra-point miss was critical given the final score, but it's worth pointing out that's Badgley's first miss of any kind this season. The rookie kicker replaced Caleb Sturgis as the starter in Week 10 and remains a solid fantasy option given his place in an excellent Chargers offensive attack. Badgley made both of his field-goal attempts and both of his PATs in the 20-6 win over the Raiders on Sunday. Badgley was officially signed to the Chargers' active roster Monday, Ricky Henne of the team's official site reports. Badgley is likely to be promoted from the practice squad to serve as the Chargers' kicker Sunday against the Raiders, Adam Schefter of ESPN reports. Badgley cleared waivers and is expected to be signed to the Chargers' practice squad, Eric D. Williams of ESPN.com reports. Analysis: Badgley was waived by the Chargers following Caleb Sturgis' return to full health, and the rookie will likely find a place on his former team's practice squad. The Miami product converted all three of his field-goal attempts and was perfect on extra-point tries during his two starts with the Chargers. Badgley was waived by the Chargers on Tuesday, Adam Caplan of SiriusXM Radio reports. 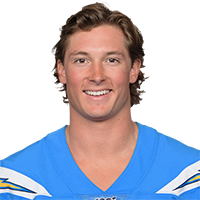 Analysis: With Caleb Sturgis (quadriceps) nearing his return, the Chargers no longer had a need for Badgley, despite his strong showing with the team. The rookie kicker converted all three of his field-goal attempts and didn't miss an extra point. It's likely Badgley will be called upon for a tryout the next time a team is searching for a kicker. Badgley converted both of his field-goal attempts and both of his extra-point attempts in Sunday's 20-19 win over the Titans. Badgley will handle kicking duties in Sunday's game against the Titans in London with Caleb Sturgis (quadriceps) inactive for the contest, Ricky Henne of the Chargers' official site reports. Badgley could continue to serve as the Chargers' kicker in Sunday's game against the Titans in London, Ryan Kartje of The Orange County Register reports. "Mike did a good job," coach Anthony Lynn said, referring to Badgley's performance in the 38-14 victory over the Browns in Week 6. "Maybe we'll let [incumbent kicker Caleb Sturgis] heal another week and go with Mike. Right now, we're just going with the guy that's healthy. When they're both healthy, we'll figure it out." Badgley will make his NFL debut for the Chargers in the absence of Caleb Sturgis (quadriceps), who is inactive for the Week 6 matchup against the Browns. Badgley could handle kicking duties for the Chargers on Sunday against the Browns with Caleb Sturgis (quadriceps) considered unlikely to play, Ian Rapoport of NFL Network reports. Coach Anthony Lynn said that Badgley will act as a "security blanket" for the Chargers in the event Sturgis is unable to serve as the team's kicker Sunday against the Browns. The Chargers will sign Badgley to a contract Thursday, Adam Schefter of ESPN reports.